A place to collect and share my favorite recipes! Enjoy! Feel free to leave a comment, I'd like to know you stopped by! If you make a recipe, I hope you will comment and let me know how it turned out! The name of this recipe is a real mouthful but I don't want to leave anything out! Inspired by https://www.kitchentreaty.com/slow-cooker-pumpkin-chickpea-red-lentil-curry/, this is oh-so-good comfort food. If it would ever start FEELING like winter here in Denver, this is perfect to warm you up. I didn't know it would be blog-worthy when I made it so didn't take pictures along the way, whoops. -1/2 butternut squash, peeled and seeded. I only cut mine into 3 giant chunks because cooking it disintegrates it! -curry powder: I used about 2 T regular curry powder and maybe 2 t. hot madras curry powder-it wasn't spicy at all. I'll add more next time. add all other ingredients to crockpot except coconut milk and cilantro/sour cream. Add ground turkey/onion mixture on top. Cook on low for 6-8 hours or high 4-6 hours. You'll know it's done when the lentils and squash are all falling apart. Stir well to ensure the squash is well disintegrated and mixed in. Add coconut milk, serve, and garnish if preferred. When you're sick, nothing but chicken noodle soup will do! I even braved Costco on a Saturday when I realized I was out of chicken. Salt some water in a small pot and throw the chicken breasts in to simmer. While they're simmering, chop all those veggies! Put a drizzle of oil into a deep pot or dutch oven and put in the onions. After a couple minutes, add the carrots, celery, and garlic. While those simmer, remove the chicken out of the water to cool. Then pour chicken water through a mesh strainer and add the water to the pot, with some "better than boullion" or boullion cubes. That gave me about 2 cups of liquid, so I added 2 more cups from a box. Add mushrooms and peppers if using, thyme, parsley, pepper, and oregano. Don't add salt until you taste it, because the stock contains salt and may be enough for you. If you want to let it all simmer for awhile, feel free. Check your pasta directions, put in the pot, and cover with broth if needed. I added 2 more cups of stock to the original 4 cups. Simmer according to package directions, probably 10-15 minutes, and remove from heat. Taste and add salt/pepper if desired, and serve! Today is a snow day! I always have one or two things cooking when the weather turns cold. This one doubles as an air freshener for your whole house. Whenever I search my blog to see if I've posted a recipe I want to make again, I know it's a winner! Put it all into a medium to large size pot. If you have cheesecloth you can certainly use that, I just throw everything in and fish it out with a slotted spoon when I'm done! Let it sit on the stove on low all day, or sip/serve to the kids when they come in. You can certainly add water, as some recipes recommend (up to a quart), but I like it the way it is. If I were an adult, trapped with a bunch of small people home from school and acting all crazy and cooped up, I might possibly splash in some Fireball for myself. Just saying. Inspired by http://www.kalynskitchen.com/2014/01/green-chile-chicken-mock-enchilada-casserole.html I first got the idea to use green chilis instead of tortillas from Kalyn’s Kitchen…it’s healthier, easier to skip all the rolling, plus those tortillas get so soggy in leftovers. I’m sick to death of shredded chicken, so I changed it up, but check out her recipe if that sounds good. It kind of took a long time and made a fair amount of dirty dishes, so plan accordingly. I’m in love with the result! Pour the cans of green chili sauce into a small saucepan and simmer on low so it reduces, stirring occasionally. This takes some time so start it first. Brown ground turkey in a large pan in a little bit of non-stick spray or oil. Drain, then add onions. After a few minutes, add garlic and cumin. After a few more minutes, add drained beans and turn off the heat. Meanwhile, preheat the oven to 375 and drain the green chilis. Spray a casserole dish with non-stick spray. Take half of the green chilis, open up, and use fingers to slide off the seeds and extra water, and make a layer in the bottom of your pan. Top with half of the turkey/bean mixture. Add sour cream and cream cheese to the reduced green chili sauce. Mine stayed a little lumpy, but I didn’t stress out since it got baked anyway-it wasn’t noticeable! Put half of the sauce on top of the turkey, as well as half of the cheese and olives, if using. Layer the other half of the green chilis, turkey mix, sauce, cheese, and olives on each other. Bake for 40 minutes uncovered at 375. Feel free to turn on the broiler for the last couple minutes for a nice brown topping! Let sit for a few minutes before cutting. This will serve 6-8. I didn’t even miss the tortillas! have on hand! 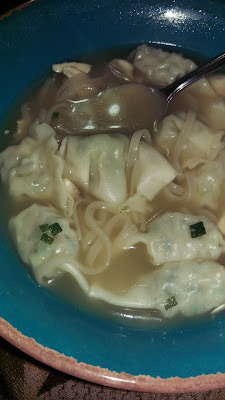 I think the only necessities are some sort of broth and the wontons; I was determined to use what I had on hand and not run to the grocery store! This is super easy but it helps to read cooking instructions for noodles, if you use them, and wontons. I added all ingredients before the noodles in order and heated to a simmer. My noodles needed 5 minutes and my wontons 1-2--so I added the noodles and set a timer for 3 minutes, then added the wontons and scallions, and set a timer for 2 minutes-that's it! Done! I didn't plan on publishing this one when I started making it, so I only took a couple of photos, and they were with my phone. My bad. Usually recipes need some tweaking before becoming blog-worthy, but I thought this one was a winner! 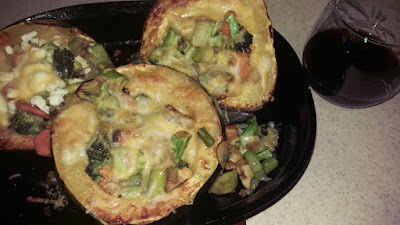 I LOVE acorn squash, and tis the season! I wanted a recipe I had all the ingredients for-after reading through dozens I decided to make my own! about 1.5 cups of cut up asparagus OR broccoli florets (including stems), or a combo of both. Stuff squash with filling, cover in cheese, bake at 350 for about 5-10 minutes or until cheese is melted. Eat with a spoon. I eat as a main dish. I can't believe I don't have a recipe for stuffed bell peppers on here! I guess I always make them up as I go, depending on what I have on hand. Here is a basic recipe to start from-as always, be creative and add what you like! optional add-ons: mushrooms and almost any veggie go great! If you have more veggies you can use half the meat. Add them in at the same time as the onions. Cook quinoa according to instructions-usually it's 1 part quinoa to 2 parts water. Don't forget to rinse it first!! Wash and cut peppers. If you can find the shape that stands up, go for it! Peppers here aren't quite shaped right for that so I cut them in half. Arrange in a baking dish. Not all of mine fit, I had to use a second, smaller pan. If you arrange them snugly, they'll stay where you put them better. Same thing if you cook standing up. Preheat oven to 375. If you like really well-cooked peppers, you can throw them in, without stuffing, for a few minutes. I personally like to just cook them in the toppings and have them a little crunchier. Start browning the meat. Drain off fat when meat is about half cooked, and add onions, cumin, and chili powder. Cook meat through. Add tomatoes. When quinoa is cooked, gently stir it into the meat mixture as well. *Oven disclaimer* I have a South American oven (no top burners) on gas, using Celcius. Your oven is probably different so just keep an eye on it! Cook the peppers for about 20 minutes, then add cheese and cook a few minutes more. Everything in them is cooked so it really just depends on how well you want your peppers done.